Hepatitis B virus (HBV) causes severe liver disease. Although a vaccine to prevent HBV is available, there is no cure to treat people who are already infected. Researchers aim to design new drugs against HBV that target its capsid, a protein shell at the core of the virus that encloses its genetic blueprint. 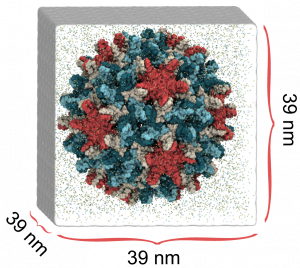 During infection, the capsid drives delivery of the blueprint to the host cell nucleus, where it is used to generate new copies of the virus. While the structure of the HBV capsid had been previously determined, its motion, which underlies its role in HBV infection, had not been characterized at the atomic level until recently. 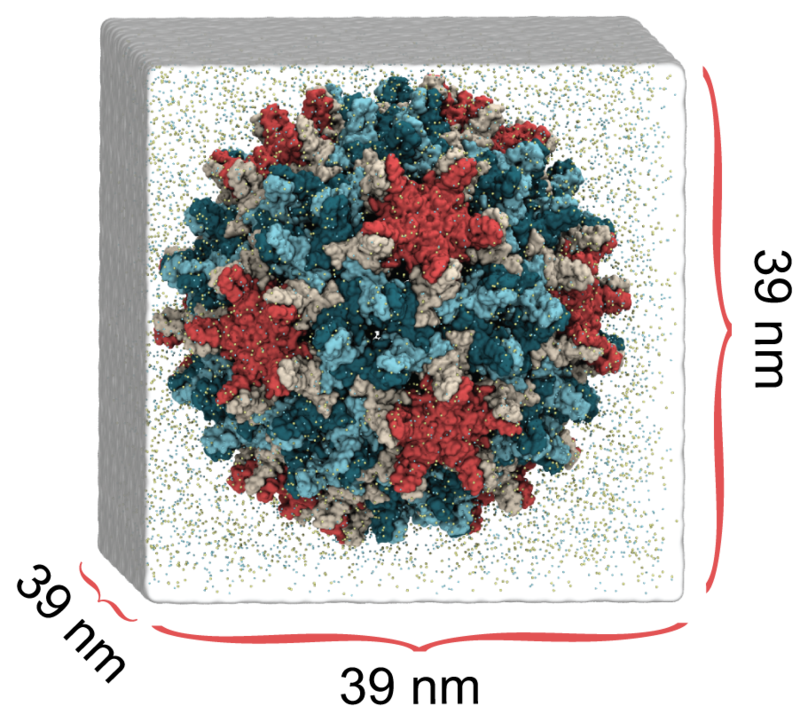 In a study published in eLife, we used molecular dynamics simulations on the microsecond timescale to observe the motion of the HBV capsid and its influence on surrounding water molecules and ions. We learned that the capsid is extremely flexible, and that this is likely the reason experimental microscopes have not been able to obtain high-resolution images of the capsid. We also learned that the capsid can distort asymmetrically, which may be important for the capsid to accommodate the asymmetric blueprint it encloses, or to squeeze through the nuclear pore into the host cell nucleus. Finally, we learned that the capsid translocates ions across its surface through triangular-shaped pores, and that positively-charged ions translocate five times faster than negatively-charged ions. In the human body, the capsid proteins include positively-charged tails that expose themselves to the capsid surface, which signals the host cell to transport the capsid towards its nucleus. Our observations suggest that the tails are exposed through the capsid’s triangular pores, not through hexameric pores as previously thought, and that the capsid can control this exposure based on changes in tail charge that also occur during infection. By revealing details about how the HBV capsid functions, our results imply new strategies to target the capsid with drugs. For example, drugs designed to rigidify the capsid could inhibit asymmetric distortion, and drugs designed to block triangular pores could inhibit cellular signaling. Importantly, our results also indicate that cryo-electron microscopy, which recently won the 2017 Nobel Prize in Chemistry, may be limited in reaching atomic resolution for biomolecules as flexible as the HBV capsid.